Excessive processes can be a bane for PC users, often chewing up the resources and the processing power which would be better assisted elsewhere. Unfortunately, Windows doesn’t provide many options to deal with these issues natively, and itself does not contribute much to deal with such processes and resources. While you can adjust the process priorities for the session, and there is not something available in the frontend. If you're an experienced user, though, then traversing across the menus will reveal the different kinds of exciting features. That’s where system optimization software such as Process Lasso come into their own. If this sounds like it might be complicated, then you're right - the underlying technology is. However, the developers have gone to lots of trouble to hide it. You don't have to spend an age configuring different prospects and settings before you can start, just install the program and it'll work wise enough to work on its own. Process Lasso is a long-standing process-tamer that offers a solution to that issue and others. At its core, it makes sure that high-priority processes are not slowed down by other processes running on the system. 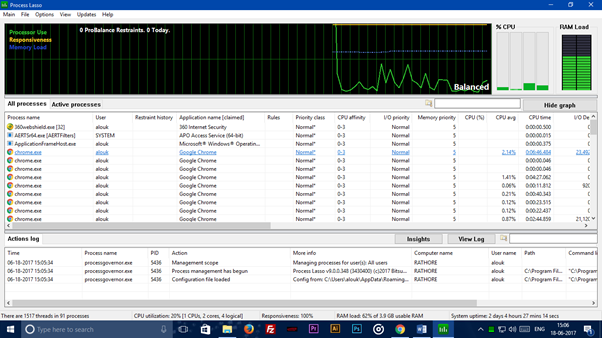 If you're going to dig deeper, you'll discover that it gives you full control on how the tool handles that on your PC. Bitsum, the leading software company behind the product, has just released Process Lasso 9. It helps you to over the process management issues that you've been suffering a lot of time right now. So, without any more speaking, let's get started with the review of Process Lasso by Bitsum. Bitsum offers Process Lasso 9 as a limited free version as well as a Pro version. The free version offers some of the commercial features of Process Lasso Pro but for a limited period (usually 3-14 days) after which they'll not be accessible anymore. Also, various adware is shown on startup and in between the running of the application or using them from the system tray. The Pro version is available for an affordable price of $37 commercially with a lifetime subscription. You can also opt for the yearly one at $28, and monthly for $7. All the licenses come with unlimited updates and excellent after sales support. 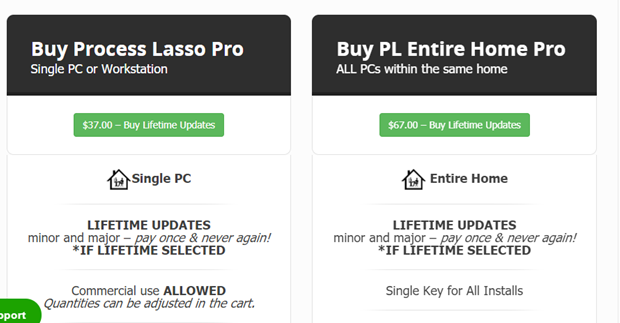 You can also buy the Home Pro version which supports unlimited devices for the Process Lasso 9 and costs $67 for the lifetime license and $47 for the yearly one. With the latest update for the Pro version 9, many new killer features can be expected, notably CPU affinities alternation and broad its compatibility. The changes, on the other hand, may be well worth of an upgrade. Not much of concern for the free users, however, the paid customers who bought the lifetime license are entitled to such services. 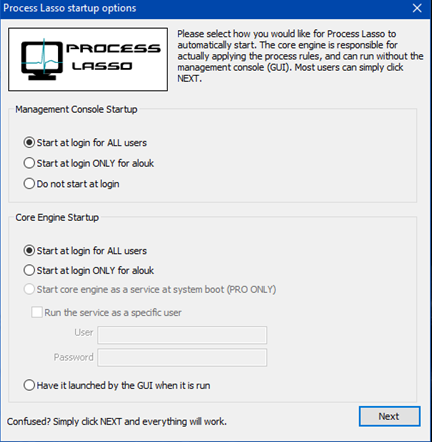 As soon you start the Process Lasso 9 for the first time, the tool displays a list of processes operating on your system. 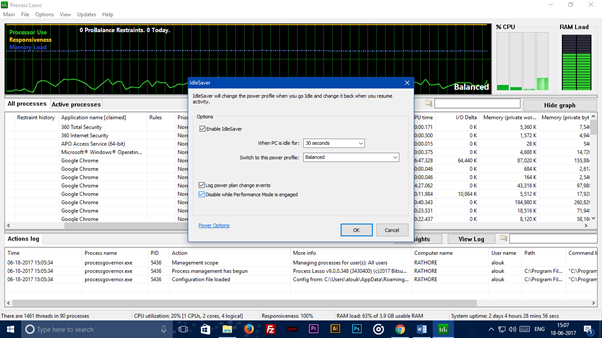 Similar to the Task Manager, the information about the current and past resource usage, and activities log at the bottom highlights among other things whenever new processes are started or terminated. Bitsum's Process Lasso strongly runs on two of the program's main algorithms, the Pro Balance and Game Mode, which are enabled by default. Pro Balance adjusts the priority of processes running on the system automatically. It makes sure that when taxing applications are running, other processes won't lag. The one unusual thing of Process Lasso is that the Game Mode is limited to Steam by default. It might be a new power plan that ensures maximum performance during the gaming by limiting background apps and running at full CPU power. However, you can also add your previously installed games and processes to Process Lasso, if they are not Steam related. The optimizations would work on those games too. Another mode in Process Lasso 9 is the SmartTrim. It is a smart memory optimizer with its core functioning that disables brute-force to free up some RAM on your system. It is not enabled by default, but you can do so by navigating to the features and choose SmartTrim. Talking about the features, IdleSaver is also an eye candy and focuses significant interest of the users towards Process Lasso 9 Pro. The mode switches the power profile on the fly while the PC is idle. 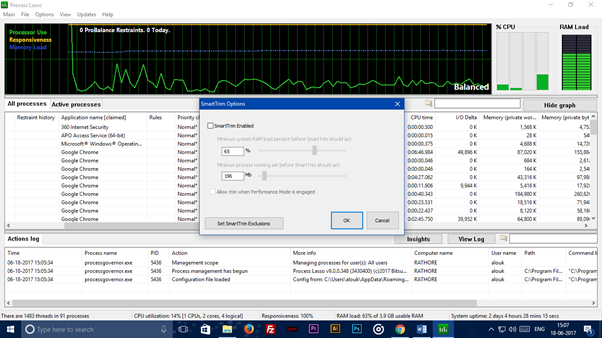 You can simply get full performance output while working on the system (or the PC is crunching data in the background), and the energy saving mode when your computer is idle. It is not behind with the customization options as well. One of the best features of using Power Lasso is that the program puts you in control whenever you want to. You can enable SmartTrim and let it be, or you can either alter with the configurations to run it under your accordance. Also, you may enable it even while in the gaming mode and set exclusions so that some operations won't be asked to release working sets when the feature is triggered. The same applies to the other features. ProBalance crafts lots of options in this regard. You can set thresholds, change CPU affinities, ignore foreground processes or make sure it excludes system services as previously mentioned. The default options are usually logically set, but it you can always tangle with the manual setting to make sure that you get the most out of your system. After all, it is your PC, and you'll be working on it. However, Process Lasso's default settings are exceptional enough to optimize any computer. And last but certainly not the least, Process Lasso allows you to change settings for select procedures and changing process priorities, I/O and memory priorities permanently, or restrict it to one running instance. Moreover, the always terminate option stops a particular process whenever it starts running. It comes handy when you don't want any interruptions during a particular work. It's also feasible to limit the cases of some operations or prevent others from moving at all. Moreover, the useful Gaming Mode optimizes the system for full-screen games, while also temporarily alternating your PC in the High-Performance power mode for an extra speed boost. 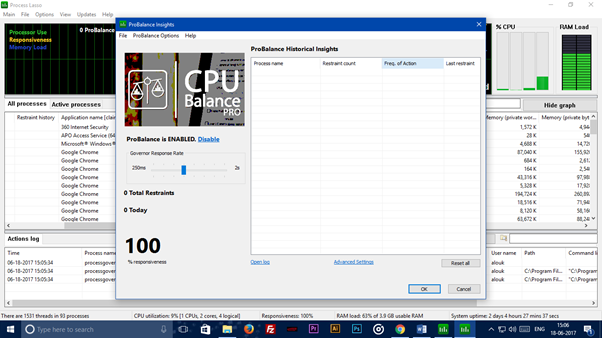 So, this was my review on the very reliable Power Lasso 9, the all in one CPU Optimization software for anyone who’s suffering from slow or unmanaged computers. Do share your thoughts and let me know if you’re going to the tool as well. Bitsum recommends going for the trial version first. Cheers!